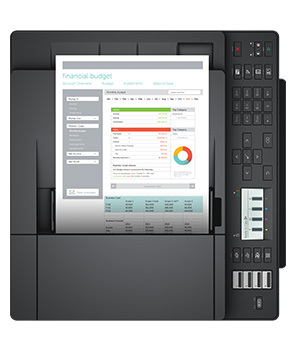 Simplify everyday printing and imaging tasks with a space-saving, 4-in-1 color multifunction printer with essential productivity features that let you accomplish more. Get connected easily: DellTM Printer Easy Installer with WiFi*, Ethernet and USB connectivity options. 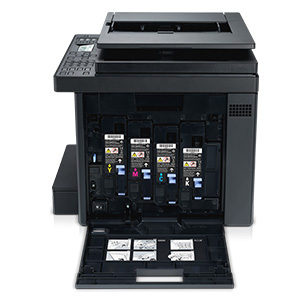 Superb speeds: Get fast print speeds of up to 18ppm* (black/color) and scan speeds of up to 17/7ipm (black/color). Connect and share your printer with ease: Get flexible connectivity with USB, WiFi* and Ethernet options. Stay up and running with automatic alerts: With the Dell Printer Hub,* you will get automatic alerts when firmware and software updates are available, or when toner runs low. Toner reordering is convenient with direct access to compatible toners. To reduce maintenance, the E525w comes with a single fuser unit that is designed to last the life of the printer. Brilliant results at fast speeds: Get crisp text and vivid color prints at superb speeds of up to 18ppm (black/color). * Scan documents quickly at up to 17/7ipm (black/color). Secure print release: Keep sensitive documents private using the Secure Print feature. With this security feature, print jobs are password protected and released in 3 easy steps: select Secure Print on the control panel; key in the valid user PIN on the 10 digit keypad; choose the document and print. High duty cycles: With a duty cycle of 30,000 pages per month,* you can rely on this printer to handle everyday work demands. Eco-conscious design: The E525w meets the latest regulatory and environmental standards, including ENERGY STAR qualification, Restriction of Hazardous Substances (RoHS) compliance and EPEAT* Bronze registration. 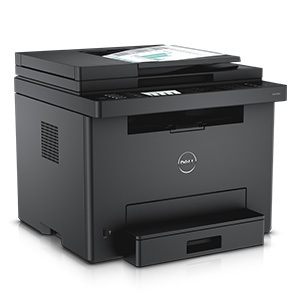 Minimal upkeep: With a single drum/fuser unit designed to last the life of the printer, all you have to replace are the toner cartridges when you receive the low toner alert via Dell Printer Hub. * For optimal print results, always choose Dell original toners. Keep your downtime to a minimum and your business running smoothly with outstanding support from Dell. In addition to your 1-year Limited Hardware Warranty* and a 1-year Advance Exchange* after Remote Diagnosis* Service,* you can choose dedicated support 24/7 with Dell ProSupportTM* service options.